The bewildering number of the Petits Grands Prix was undiminished in 1947. The races at Forez, Dijon, Nantes and Lille, which in truth had been the ones with the least technical interest, were not repeated but were substituted by three classics: Pau, Reims and Comminges and by a one-off return, at Nîmes, although not on the insipid downtown course used pre-war, but on a new one in the countryside of Courbessac, just outside town. Marseille, Nice and Albi weree again on the calendar, while the Grand Prix du Salon, which took place in the late autumn after much uncertainty, moved from the Bois de Boulogne to the re-opened Monthléry. There was no Bois de Boulogne race for Grand Prix cars in 1947, only an important meeting for voiturettes was held there. The return of the Grand Prix de l‘ACF, which took the place of the race in St-Cloud that could not be repeated because of the problems provoked in the Paris traffic, was supposedly the main race of the year. Unfortunately, delays and uncertainties in the organisation had the effect that its field was the average field of a Petit Grand Prix. Finally, a new typical Petit Grand Prix was a one-off race in Strasbourg, which tried, with no luck, to re-establish a tradition that had seen Strasbourg as the venue of the GP de l’ACF in the 20s. The races listed above together with the Grand Prix de l’ACF, counted towards the French overall Championship for 1947, which was this year run from the beginning by the ACF. As a matter of fact, one further race counted, the II Circuit des Remparts, a voiturette race in Angoulême held on June 15th, yet another post-war revival. As a consequence, classics such as Pau, Reims, Albi and Comminges – not to mention the GP de l’ACF – attracted the best foreign participation, Alfa Corse excluded, but it was equally impressive in the other races: five out of the eleven Championship races were won by foreign drivers. The hastily organized Coupe du Salon was the exception in this respect. This race, nonetheless, was an ecxciting one, being the Championship decider. The point scoring system for the Championship was more complicated than the previus year: 10 points to the winner then 6, 5, 4, 3 down to fifth place, 1 point for starters, 2 points for the fastest lap. The 1947 Championnat de France des Conducteurs would be a thriller, decided only after the last race. Finally, a “French” race failed by a whisker to be raced on the mighty Nurburgring. It is yet another typical story of the period. The fact is that the Nurburgring was located in the French occupation zone of Germany. The unfaltering Mestivier, president of the AGACI and nicknamed “sparkplug”, was granted permission by the French Governor, Hettier de Boislambert, to use the Sudschleife of the Nurburgring for two races on July 27th, 1947: the Coupe de Rhenanie for Grand Prix cars and the Coupe Rhin-Danube for voiturettes. The races would be organised by the A.C. d’Alsace and by the ACIF (the Paris Auto Club) with the cooperation of the AGACI. The announcement was published by l’Equipe on May 23rd and by L’Action Automobile in the June issue. On the July issue of the same magazine, an article, with map, described the Nurburgring, gave account of the organizing committee and of the roster of the French officials in Germany, and gave the addresses of the ACIF and AGACI Paris offices for buying tickets. But on July 10th, the headline on the Equipe was “Pas de course au Nurburgring!”. What had happened? While reading his newspaper one morning, the eyes of M. Hettier de Boislambert had fallen on the report of the Reims race. Neither French cars nor French drivers appeared at the top of the results. De Boislambert immediately recalled the permission for the races: a victorious Power could not show any weakness to the defeated people. So the Nurburgring would have to wait until 1949 to see again racing cars on its tarmac. An official authorization was necessary to manufacture cars in France after the end of the war. The government planning gave priority of the use of rationed raw materials to the manufacture of small production cars in large series. It was only in June 1946 that Tony Lago obtained permission to build 125 touring cars, all destined to export. This was the T26 Lago Record model. Chassis and body were similar to pre-war models, whereas the 6cyl 4.5L engine was new. Lago’s chief designer Becchia had left for Citroën in 1941, so his deputy Carlo Marchetti – another Italian – was promoted to the position and put to work on the T26 engine already in 1942. Once the authorization for the production of the the Lago Record was obtained, Tony Lago did not hesitate. He put his designers to work on a racing engine derived from the Lago Record unit. A chassis was ready for it, the one used for the three 1939 monoplaces, of which the MC was racing in 1946 with good results. Lago announced that a series of 12 cars was foreseen and that – very optimistically – six were going to be put in production during 1946 and would be ready by September! French drivers were starving for good racing cars and down payments started floating towards Suresnes. Lago’s reputation and the good showings of the MC during the season were a big promotion for the new car. By the end of the year 10 cars were ordered with two more during 1947.2 The cars were to be delivered in the order in which down-payments had been paid, with no regard to the quality of the driver who had placed the order. At the end of 1946, Chôtard, “Levegh” and Grignard sold the racing cars which they had used during the season. Lago’s optimism had convinced them and so did the fact that the project was designated as “Course 47”. Unfortunately, authorizations for building the racing cars were slow to arrive and, moreover, the factory was busy with the production of the Lago Record. The first of the series of new Grand Prix cars, called T26C, appeared on track at Monthléry only in April 1948 and was delivered to Louis Rosier early in May the same year. An article in L’Equipe of 15 November 1946 gives a complete account of the state of the Ecurie (pictured with its full line-up in Sweden). The Talbot-Lago Monoplace Centrale, will be the top car in the lineup of the Ecurie for 1947 and would be entrusted to Eugène Chaboud. Chaboud’s Delahaye 135CS coursifiée with Desplats body would be Yves Giraud-Cabantous’ mount. Chaboud retained ownership of the car. Vallée had the Delahayes of Charles Pozzi and Henri Trillaud rebodied at his expenses and bought a fourth chassis from the factory. The job was done by Desplats in the highly debatable style of Chaboud’s car. Pozzi and Trillaud retained ownership too. Internal squabbles provoked by Chiron’s “good” offices and by Vallée’s personality will modify the line-up of the Ecurie at the beginning of June so Louis Chiron would race the MC for most of the season accompanied by Giraud-Cabantous in a Talbot 150C with 4.5L engine, loaned – or hired – from Lord Selsdon. Chaboud, Pozzi and Trillaud will go their own way at the beginning of June. Mouche and Grignard - and Loyer a bit later - had already left. L’Equipe published a series of laudatory articles on the Ecurie during the winter. The departure of the team for the Winter races in Sweden was announced in the front page of the Jan. 28th, 1947 issue. The mechanics had worked for one month to prepare the five cars under chief-mechanic Régnier “with a methodical organisation”. The MC was under the particular care of Henri Robert, loaned to Vallée by Lago. Everything about the Ecurie was sorrounded by an aura of optimism: Lago’s positive assertions and Vallée’s ebulliency had hit the target. Vallée was very keen on the public image of his team. “The mechanics had blue overalls for the days of practice and silk [!] ones for the day of the race. He cared a lot about this and was proud of the good looks of his team. The mechanics were a bit ashamed in front of their colleagues from the other teams. Pozzi’s mechanic Turari said: ‘We really looked like clowns on Sundays’”. The penury of row materials and of special parts had killed the Watney-Itier plan for one-model racing in early 1946. Watney5 had to find a replacement to ensure the presence of the Delage marque on tracks. He had the excellent 1939 3L 6C sports car at disposal and a copy of it was ready for the Dijon race in 1946 with Louis Gérard at the wheel. Three weeks later, Gérard’s accident with Mazaud at Nantes had as a consequence the suspension of his licence. Gérard’s appeal was rejected on January 29th, 1947. Thus Watney remained without his star driver, yet he decided to entrust him with the cars as the manager of an independent team, the Ecurie GERSAC. GERSAC was either a brand of Armagnac produced by Gérard according to some sources or a wholesale firm – owned by Gérard – selling liquors, according to others. Five Delage D6-3L were built and they were passed onto Gérard as long as they were completed. Three of them appeared for the first time at the re-opening of the Monthléry track in February 1947 (pictured), feted by a parade of racing cars, the fourth in Perpignan and the fifth at Monthléry in early June. By then Gérard had realized that the cars, although excellent as sports cars, did not stand a chance when stripped for Grand Prix racing. Their proverbial robustness was not sufficient because of the feeble 150 bhp power output and a serious overweight problem. Unfortunately restrictions in fuel and tyres did not allow long distance racing for sports cars as yet, where the Delages could have stood more chances of success. Second places in Pau and Perpignan and a third in Marseille were accompanied by an indifferent showing in Jersey and a dismal one at Nîmes The agreement between Watney and Gérard was terminated between the Grands Prix of Switzerland and Belgium, after another very poor showing at Bern. Ecurie GERSAC was officially presented to the press on April 1st at its premises in Paris, 24 rue François-Bonvin. The three cars had a new badge: a chromium-plated circle with an Ecurie GERSAC inscription, instead of Ecurie Walter Watney as in Monthléry. Henri Louveau was the technical director of the Ecurie and its top driver. Phi-Phi Etancelin, Pierre “Levegh“, Jean Achard and Maurice Trintignant were chosen as drivers. The fifth car would appear at Monthléry winning a minor race on the same day as the Swiss Gp. It was driven by GERSAC mechanic Maurice Varet, an excellent driver who seldom got the chance to show his talent. The 3L Delage D6 had a chassis borrowed from the Delahaye 135CS. The engine was a derivation of the production D6-70, 2700cc. This was a short stroke engine which allowed careful transformation by Watney’s chief technician Antoine Pinier. A reboring to 3L, a change of carburettors and of admission ducts and a rather dramatic increase in revs gave about 150 bhp, which had been plenty enough for a truly excellent show at the Le Mans 24 hours in 1939. The car was practically undestructible, its main shortcoming being an excess in weight, assessed on about 250/300 kgs, not a small figure in any case. Since the Old Fox had obtained the MC back, 90202 was given to Giraud-Cabantous who had stayed on the team. Yves was going to use it until the Grand Prix de l’ACF. After that the car returned to England since a new acquisition was shining in Vallée’s garage, the Talbot Lago MD 90131, brought back to Europe from its American exile by Luigi Chinetti. Giraud-Cabantous would use this car to win the last race of the season, the Coupe du Salon. Pozzi and Chaboud raced both in their Delahayes until the Grand Prix d’Alsace where Pozzi arrived with a new car: the Talbot-Lago Spéciale 90203. Its chassis number indicates that it was the third T150C 4L to obtain a light-alloy 4.5L engine. The chassis was the original one of the T150C 82930, which had exchanged numbers with 82933 after a crash, then became 90203 in 1939. It had originally received a body by Figoni-Falaschi and was sold to rich gentleman driver “Helde”. After being confiscated by the Germans during occupation, “Helde” (the banker Pierre-Louis Dreyfus) had got it back in 1946 when Sommer raced it at Brussels. Pozzi had purchased it during the off-season and had it rebodied by the Chappe Brothers, but the work did not come out well. As much as the burgundy-red roadster by Figoni-Falaschi was gorgeous, so the new lighter body was ugly. In any case the car proved to be fast enough when it was brought out in Strasbourg after a toilsome change in the brakes, from cable Bendix to hydraulic Lockheed, carried out by Turari. Chaboud had also taken a new car to Strasbourg, a Veritas with BMW 328 engine emanating from Ernest Loof’s workshop in the French sector of occupied Germany. Chaboud visited the Veritas works in June 1947 and did some testing with the new car. He was very much impressed and Loof offered him a works drive, also to please the French authorities. In Strasbourg the car proved slow and the fact that it was built in the French sector did not fool anybody: to race German cars was forbidden and, besides, the public was heavily booing at the enemy car. Chaboud switched back to the faithful Delahaye. Thanks to a lightning start to the Championship at the wheel of the Talbot MC, Chaboud still stood some chance of winning it. Very generously, Pozzi loaned 90203 to him for the rest of the season, going back to the wheel of his Delahaye. Chaboud’s Delahaye was then sometimes raced by Gaston Serraud. A second Talbot-Lago Spéciale was Louis Rosier’s 90111 (here pictured at Perpignan). Another Figoni-Falaschi cabriolet, it lost its beautiful sweeping front wings for the 1946 season. After that homemade arrangement Rosier had it “coursifiée” – some source say by the same Frères Chappe – during the off-season. The result was more acceptable than the one achieved with Pozzi’s car. Rosier kept his Spéciale very busy during 1947, while waiting for the new Talbot Lago T26C. A Talbot-Lago T150C (pictured on the right at Marseille) was also re-bodied during the winter by the same outfit that had worked on Rosier’s car. It was the ex-Levegh car 82930 ex-82933. “Levegh” had placed an order for a new Talbot and imprudently sold the old one to Edmond Mouche9 (pictured on the left). The outcome of the body transformation was very similar to the one of Rosier’s car. Mouche would have a rather busy season often sharing drives in the Talbot with another fast veteran, José Scaron. The second Talbot-Lago T150C active in 1946 underwent major transformations during the off-season too. It was 82932, which Marcel Balsa had sold to Henri Marin during 1946. Marin – apparently a very practical man – had made two decisions with no indulgence: to quit racing after a couple of tries and to modify his car, which was in any case uncompetitive. It acquired a new well-made body along the lines of the Talbot MC, while Marin worked on the engine reboring it to obtain a capacity of 4.3L and working on parts to obtain maximum revs of 6000rpm. Balsa was the appointed driver. Unfortunately money and technical facilities were not abundant in Marin’s provincial garage, so the car – now renumbered as 90101 – was stored for good after the race at Nîmes. An unusual driver-car pairing was seen at the Monthléry races. The car was a Talbot H75, chassis 80550, coursifiée. Its driver, Vedor, was “a completely unknown driver”, even to Talbot-Lago guru Pierre Abeillon. Another driver who had sold his old racing car in a hurry hoping to get a new Talbot was Georges Grignard who sold his Lecanu-Deschamps bodied Delahaye 135CS to newcomer Pierre Meyrat10 (pictured on the right). Grignard, almost idled by the lack of a car, drove his former Delahaye only at Perpignan. Another Delahaye raced during 1947 was the ex-Chôtard 46835. Chôtard had ordered a new Talbot too, so had sold his 135 CS to Serge Pozzoli. Pozzoli had bought the body of the Delage raced by Gérard at Dijon and mounted it on the Delahaye chassis. He was able to race it only twice since he crashed heavily in practice at Chimay, henceforth quit racing. The car was sold to Chartres garagiste the “silencieux” Jean Brault (pictured on the left). Maurice Trintignant, who was without a Grand Prix car after the demise of Ecurie Gersac and having ascertained that his glorious Bugatti T35/51 could not stand the ravages of time anymore, a new particularly ugly body not-withstanding, showed incredible speed in Brault’s car at Comminges. Bordeaux driver Pierre Larrue made sporadic appearances in his coursified Delahaye 135MS, 60116, while the president of the Automobile Club of Auvergne, Henri Rigodon was a regular starter in the sports cars races in the small meetings at Monthléry. Sometimes his Delahaye 135CS, ex-Ecurie Menier, was stripped of its wings and lamps for the racing cars events in those meetings. Hence also chassis 47186 finds its way in these records. Jean Achard started his season driving Delages for the Ecurie Gersac. The Delahaye 155 that he had used during 1946 was lying idle so it was lent to “Levegh” for the race at Nîmes. Achard’s return in that capricious car for the race at Albi provoked a disaster. The new Ecurie GERSAC had three Delages D6.70 ready for the opener at Pau and driven by Phi-Phi Etancelin, “Levegh” and Achard with the car-less Grignard and test driver Varet as reserves. Henri Louveau joined them, when the fourth car, Henri’s faithful 880004, was ready for Perpignan. “Levegh” was then dropped in favour of Trintignant at Nîmes. After that race the team closed down and the Delages were returned to the factory. Louveau retained the right to use 880004, and then purchased it at some point later in the season. It was raced by Trintignant at Reims, then by Maurice Varet. Varet, who was an excellent driver who did not get any chances in his career, managed also to win – in 880005 – a small, but exciting, race in Monthléry the same day as the Swiss GP. Alexandre Constantin drove very well Louveau’s car at the Coupe du Salon. Louveau had a Maserati 4CL – different than the one used the previous year - put at his disposal by Scuderia Milan for most of the French races, with the exception of Reims, where he showed up with a 4CM, chassis 1559. French 1946 Champion Raymond Sommer went through a frustrating season. 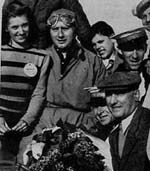 After the many victories obtained the preceding year he could not finish a single race during 1947. Two cars were used by the “Ardenne’s Boar”: a personal Maserati 4CL, the ex-Milan chassis 1579 (now painted blue) and the unreliable two-stage Milan-Maserati, with the engine modification carried by Scuderia Milan technical director, professor Mario Speluzzi. “Raph” had a new Maserati 4CL ordered for him by Ecurie Naphtra Course. While waiting for the new car an interim one was purchased, chassis 1571. The new car, chassis 1588, was delivered in the month of July, and was then entrusted to Pierre “Levegh” who heavily crashed the interim car during the Grand Prix de l’ACF. The rather ineffective enthusiast François Michaud hired a Maserati 4CL, c/n 1564, for the races at Marseille and Nîmes and Benoît Falchetto took his weird Bugatti T35/50B to some of the races. A curious return was the one of hyper-veteran Louis Decaroli, romantically at the wheel of a Bugatti T37A in the Nîmes race. More substance was shown in the return to racing of Bordeaux garagiste Charles Huc (1913-c. 1962). He had driven a Bugatti in the late thirties and came back to promote a thriving business as a luxury cars dealer - “à la Pozzi” – based in his garage located at 189 rue Font d’Audège in Bordeaux. He went to the Monthléry meetings and to Comminges in a Bugatti T51A and at the end of the year would buy Rosier’s Talbot Spéciale c/n 90111. He then switched to a SIMCA 8 Spl. and quit racing in 1950. Also the interesting Guérin-de Coucy (was entered for the race at Comminges but did not show up. Its enthusiastic builder, Francis Guérin was supposed to drive it. A glorious car was the Maserati 4CM of Marseille haulier François Antonelli. This was the ex-Lurani, Dodson c/n 1128, which had been raced before the war with two engines, a 1100cc or a 1500cc. Antonelli had the supercharger removed from the 1500cc engine and substituted by two carburettors. Quite a substantial number of new racing cars for the 1100 s/c, 2L u/s class had shown up for the season, besides the Equipe SIMCA-Gordini. Most organizers of the Grands Prix opened their doors to the best of them, sometimes including a special classification as at Comminges and at the Coupe du Salon. Thus we will see in Grand Prix racing the Cisitalia D46s of Harry Schell, Raymond de Saugé (pictured on the left), “Robert”, Roger Loyer and newcomers Robert Manzon and André Boyer. Marseillais Marius Porta, a driver of Bugatti sports cars in the 30s and of small Renaults at Le Mans in the 50s, substituted for Manzon in the Albi race. Charles de Cortanze’s Darl’Mat-Peugeot Spéciale single-seater, built on an Amilcar Pégase chassis, was also seen at Albi and Comminges. The great pre-war Bugatti driver Pierre Veyron (1903-1970, pictured on the right in 1948) shared this car at Albi. This winner of twelve major voiturette international races in the years 1931/35 and of the Le Mans 24 hours race in 1939 was at this time uncertain about his future in racing. Veyron was later conviced by Paul Vallée to join Ecurie France for the 1948 season. He had promised him the wheel of a new Talbot upon delivery, so Veyron started the season driving for the Gordini team to get back in touch with racing. However, it was only one of Vallée’s notorious publicity stunts. Veyron enjoyed a well-deserved big reputation, so Vallée could boast that he was going to field a very strong team for 1948 composed by Chiron, Veyron and Giraud-Cabantous. Unfortunately there were only two cars, neither of them new, nor, besides, available to Veyron. The new Talbot materialized only at the end of the year. Veyron had felt that Vallée had swindled him and had left the team in disgust at the time of the Albi race in 1948.11 Veyron almost quit racing after that. He drove in sports car racing from 1949 to 1953, and then became a manager in various firms connected with the automobile. One of these, which specialized in oil for two-stroke engines, bore his name. René Bonnet entered the new single-seat DB-Citroën, chassis 6 at Albi and Comminges also. His reserve driver at Albi was another interesting veteran, Max Fourny (1904-1991) from Amiens, who had raced cyclecars in the 20s and Bugattis in the 30s. After quitting racing, he would become a gallerist and an art publisher, specialized in “naif” painters. There is an art gallery bearing his name at Montmartre in Paris. 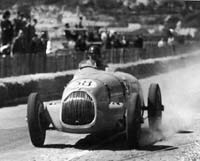 The fastest 2L car by far was Eugène Martin’s BMW 328 Spl., an offset single-seater with Frazer-Nash cylinder head, neatly prepared by the technically minded Martin. In this car he would enjoy an excellent year. He also won the “big cars” class in the fall meeting at Monthléry. A BMW 328 was also raced by Parisian car dealer André Chardonnet at Comminges. A curious starter in the Coupe du Salon was either a Fiat Testa d’Oro or more likely a Cisitalia D46 with Testa d’Oro cylinder head. Testa d’Oro was the name of a proprietary cylinder head for the Fiat 500 designed by former Scuderia Ferrari engineer Arnaldo Roselli, who had designed the famous Scuderia Ferrari Alfa Romeo Bi-motore in the mid-thirties. The name Testa d’Oro was justified by the fact that the head was cast in bronze. The Testa d’Oro cylinder head was made and distributed by a Turin outfit, La Casa dell’Auto and it proved popular with road going Topolino owners. The partner of Roselli in the firm, Giorgio Giusti, decided to publicize the product by building a sports car. The C-type (C for Corsa) head in 1947 form gave to the Topolino engine a capacity of 660cc. There is trace of only one car built in 1947 (many more and more sophisticated ones would follow in the late 1940s), so it might be assumed that this could be the car – hardly a GP contender - seen at Monthléry, though the Cisitalia hypothesis seems much more likely. As a matter a fact there is trace of the little sports car at Monthléry in other sports car and voiturette races where it behaved really well. The driver at the Coupe du Salon, Jannin, bore the same name of a pre-war Algerian Delahaye driver. 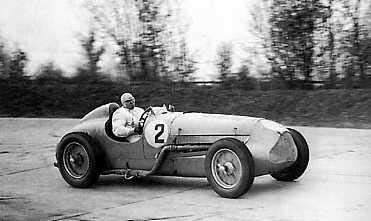 Builder Giorgio Giusti also appears in the entry list together with another voiturette that we will describe later, the ex-Gordini Balilla of Pierre Flahault and also with a Cisitalia D46 entered by an untraceable Parker. But the big news at the beginning of the season was that Jean-Pierre Wimille would drive for the Equipe SIMCA-Gordini. Conversations between Amédée Gordini and the French ace had taken place during the 1946 season. Wimille had appreciated the qualities of Gordini’s voiturettes and knew that his options were very limited with works drives virtually non-existent. There was of course Wimille’s strong link to Guidotti, team manager at Alfa Corse, but they did not provide a full racing schedule for the season. Jean-Pierre needed “the flexible deal that Gordini could agree to”. He was in the position to “…air his strong views to Gordini himself. In particular, it was clear to Jean-Pierre that Le Sorcier was compromising his results by expending too much effort in engine tuning and not focusing enough on car design and team management”. Team Gordini’s subsequent history will show that Wimille was waving the flag of a lost cause. In any case he felt that – being a faster driver than Amédée – he could improve on the speed of the cars and recommended that Le Patron retire to the director’s office, which he agreed to do although not without a degree of reluctance. Wimille put forward two demands on his arrival: a spare car, and a different, smaller and adjustable, windscreen. While the latter was easily obtained, the former materialized only once. Wimille would stay with the Equipe until Monaco 1948, before taking his leave quietly. He had retired nine times in Amédée’s cars during 1947/48 - too many for Jean-Pierre’s liking, although when he finished, he was always on the podium. He returned to a car built by Amédée only to find his death in it, the only driver to suffer a fatal crash in a Gordini. On Wimille’s part, it might have been a strange decision to drive for Gordini. “In many ways it was a typical post-war partnership, a match between reason and passion in a world where rationing was still in force.” This might explain something but not the roundabout psychological route that brought about the fateful alliance between two such different men. In any case Gordini reserved one of the five cars built in the off-season, the T15 07GC, for Wimille’s use in French Grands Prix and the main voiturettes races. Wimille’s friend Marcel Lesurque was appointed team manager and mechanic Adrien Alin was attached to Wimille’s car. Alin would have also to qualify it for some races, Wimille being notoriously not very keen on pre-race practice. As early as in September 1946, Roger Labric was writing in l’Action Automobile under the headline: Plus de courses kermesses. “The Nantes accident has confirmed the existing danger in organizing motor races on circuits not satisfying […] the maximum of security measures for everybody involved: drivers, mechanics, officials etc. What has happened in Nantes could have happened at Marseille, in the Bois, at Saint-Cloud, Forez, Perpignan or elsewhere […] It is a miracle that each Grand Prix had been able to pull out so well, but miracles are not forever, so it is ironic that a Club reputed for their impeccable organisations [the A.C. de l”Ouest, the Le Mans 24hrs organizer] had to register the first unrepairable misshap. [… We reckon that] the return of motor racing and the effort put on by the oirganizers deserve praise, despite the shortcomings that we are sure shall never happen again. […] The term course-kermesse might be interpreted in two ways: 1. the popular race-fair organised with the only purpose of attracting the greatest number of spectators to make the biggest receipts, even though the circuit is acrobatic and dangerous and the drivers are of mediocre standing. 2. the race which you still could call kermesse if you wish and which could be conceived to attract the largest crowd, but providing a real show on the track, thus offering a sustained interest to the spectator, who, when tired of seeing cars lapping around […] could find […] bars, tobaccos, restaurants, dancing-halls as at the Bol d’Or or at Le Mans. There is talk of a renewed Grand Prix de l’ACF for 1947. Let’s hope that our classic race shall bring back the words “Grand Prix” to their original value [Which was not going to be the case]. We hope to see first class drivers and selected cars racing for 500 or 600 kms on one of the beautiful tracks […] such as Reims, Le Mans, Comminges, Monthléry […]. The era of the 15 km-long “Grands Prix”, hastily organized, without sufficient warranties, has to finish in the sheer interest of motor sport, which shall maintain the favour of the public only if it will abandon, once for all, the domain of the circus and will stop cheating in the name of spectacle.” The last sentence appears astoningly prophetical today, about sixty years later. The twelve drivers were in the order: Louis Rosier, Roger Loyer, Jacques Chôtard, “Jack Seyler” Langlois, Pierre “Levegh”, Georges Grignard, Paul Vallée, Phi-Phi Etancelin, Henri Trillaud, “Pat” Garland, Johnny Claes, Robert Brunet. Loyer, Langlois and Trillaud cancelled their orders, as we shall see. “Raph”, Comotti and Sommer took their places. Chôtard and Brunet gave their cars back to the factory. Paul Vallée (1905-1957) was the founder and owner of Ecurie France. He was a complex and interesting personality as a man and as an industrialist. He started in the haulage business guaranteeing 24 hours deliveries between Paris and Marseille. After marrying a rich wife, a fact which always helps, he bought the Hemy motorcycle factory after the war, and opened a mechanical shop called SICRAF (Société Industrielle de Constructions et de Reparation d’Automobiles Françaises) at 59 rue Sadi-Carnot in Aubervilliers, in the Paris suburbs. Vallée believed that the successes of the Ecurie France were the best way to promote his other businesses. SICRAF was successful in manufacturing a popular three-wheeler delivery vehicle powered by a small motorcycle engine. Vallée shouls also be remembered for having been one of the first industrialists to understand the importance of scooters in a post-war Europe that was starving for private means of transportation. His ambitious project for building such a vehicle failed when the Italian Vespas and Lambrettas occupied a big portion of the market: Vallée’s scooter was all right, but it lost the commercial war. Vallée was in fact an intellectually brilliant man who was able to conceive ideas before others, but he was not always practical enough to put them into effect. He also liked partying and appearing in society and was keen on publicity stunts. He was easily influenced too, as it is shown by his relationship with Chiron, for instance. 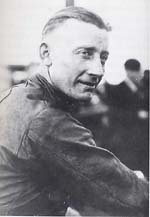 Once totally engaged in his scooter enterprise, Vallée closed the Ecurie before the 1950 season. The demise of his factory after the failure of the scooter did not affect him much. He had diversified his interests becoming a share-holder in Franco-Britannic, the French importer of Rolls-Royce and Ferrari. Although he was a good driver, Vallée raced his cars only twice during the post-war seasons. With all its shortcomings, almost all caused by Vallée’s attitudes, Ecurie France was without any doubt the more successful French team during 1947 and 1948, contributing a lot to the popularity of the Talbot-Lago marque. Vallée had accomplished his purpose: without Ecurie France the French flag would have never risen to the highest pole during those years. Even with the Ecurie in disarray during 1949, with Vallée’s head and heart both perched on scooters, his team scored their last victory at the important GP de France in Reims with his favourite driver Louis Chiron. Vallée received his car at the end of 1948. Manifestly, he had delayed the down-payment trusting Lago’s word. Controversial expatriate Englishman Walter Watney – he was born in Calais in a family of important lace makers and merchants - “was a virtually unknown whose importance has been underestimated”. He had settled in Paris in 1932, becoming the more important Parisian Delage dealer by 1933. He was perfectly aware of the terminal difficulties of the firm, which he was able to buy out at a bargain price, leaving Louis Delage in comparative penury. He then engineered Delahaye’s takeover of Delage in 1935 obtaining to his advantage a financial agreement that the Delahaye company could hardly sustain. He was able in this way to standardize the production, allowing Delage to survive and Delahaye to maintain its section of the market in years of international crisis. Half-hearted towards racing, he built in economy a beautiful coupé with a 12V engine (obtained by joining together two Delahaye 135S heads) for the revival of sports car racing in France. The ACF had let him know that the name of Delage could not be absent, so he put Louis Delage in charge of the project, yet he got rid of the car as soon as possible. It was Louis Gérard who changed Watney’s mind towards racing with his successes in his private grand-touring 3L Delage. With Gérard, Delage kept a foot in racing with no need to maintain an expensive racing department. Moreover Watney realized that at each good result of his driver, sales increased. When – at the end of 1938 – Gérard sold his car to Peter Aitken, Watney built two Delages 3L 6cyl with Delahaye chassis. By now convinced of the decisive role of racing, he founded the Ecurie Walter Watney with Gérard and Monneret as drivers. and was planning for 1946 to have 20 of these cars built for a one-model series of races run by the independent drivers association U.S.A.. In this way Watney was certain of a victory of the marque without the necessity of the long and costly program of development that traditional racing requires. Due to the post-war difficulties in providing materials and parts, the series never materialized. Unassailable evidence shows that the car raced in Italy in the Summer of 1947 was indeed the chassis 880002 that had been rebodied after Achard’s crash in Perpignan. Nonetheless Delage guru François Jolly maintains a different view. Parisian Roger Loyer (1907-1988) was one of the greatest French motorcyclists of the 1930s and 1940s. This excellent driver’s career is a typical example of the many ones severely handicapped by the war: once WWII was over, he was too old either to begin racing cars or to be able to keep himself at the top level in motorcycle racing. He then chose to forsake a professional career and to become one of the innumerable Paris “garagistes” racing either cars or motorcycles for the fun of it. Loyer came from a family of modest financial means His father was a taxi-driver so he grew up in contact with motorcars He was an adventurous, self-thought, independent man, in possession of an inventive mind which allowed him to patent several devices connrcted with the automobile. He started as a chauffeur and mechanic, beginning to motorcycle racing in 1928. His career in car racing started in 1938. He bought the ex-Berg Maserati 6CM in 1939, driving also a Watney’s Delage at Le Mans. After several one-off drives after the war, he set up a team with “Robert” racing two Cisitalias D46 in 1947/1948. Loyer also continued racing motorcycles and later joined the Gordini team by which he was employed mainly in sports car racing. He scored a couple of victories for Amédée, but his career practically ended with the end of the Gordini team, although he was seen at the odd race until 1960. He had been getting busier with his garage businesses. The first one – doubled by a transport business - was in Av. de Clichy. A later one, called “Sport Service” at 21, rue Jules Guesdes at Levallois, had become fashionable among members of “tout Paris”. Among his employees, there were two young men of the name of Jean-Pierre Jabouille and Jacques Laffitte. Loyer was an adroit driver - much faster than average and a calm, methodical man. His bodily height obliged him to assume a somewhat crouching position at the wheel, which was to becaome his trademark. At the end, he had been more succesful as a motorcycle racer than a driver. In fact in car racing he scored more places than victories. He was blond, tall and slim, much of the Nordic type and a chic Don Juan. Nonetheless, his jealousy towards his wife Raymonde and his two daughters was notorious. Louis Chiron was apparently going through a period of particular petulance. Future racing driver Guy Mairesse was a friend of Ecurie France boss Paul Vallée and tasted the flavour of car racing for the first time accompanying the Ecurie to Sweden. He found Chiron unsufferable. He tells that Louis was making a pain in the neck of himself by monopolising conversations playing down the other drivers. A particularly gullable Swedish press was dazzled by the – by now rather faded – shining palmarés of Louis who managed to put it forward at every occasion. Edmond Mouche (1899-1989) – a veteran of good class and yet another Parisian garagiste - was starting the post-war period of a long career. Mouche had been active in Grand Prix racing as far back as 1927 at the wheel of Bugattis and of the beautifully named Urano-Marguerite. A brilliant airplane pilot, Mouche had opened a garage in Beauvais and was one of the typical independent drivers of the era. His appointment as sales-chief at Peugeot for the North of France stopped his racing career, which he restarted after the war. He moved up to Grand Prix racing during 1947 with the Talbot T150C ex-“Levegh”. He then raced one of the ex-Watney Delage 3L and other big French sports cars. His career lasted well into the 50s, with several victories in small car classes at Le Mans. He had moved to Paris during the war opening a garage in 73, rue Laugier in the 17th district not far from the Porte de Champerret, which he sold in 1956 when he became head of the sales department for Chevrolet-France, joining then his great friend Auguste Veuillet at Sonauto in 1960. In retirement he became one of the main organizers of the 1000 kms. of Paris at Monthléry. Mouche had “…a difficult temper, by nature, but he made efforts to be nice to other people”. Mouche was also a champion of pigeon-shooting. Meyrat (1916-1969) owned a copper and aluminium foundry at Cahors specialising in manufacturing door and coffin handle. They later started making wheel nuts for cars, a fact that made him able to frequent the motorcar milieu. A typical gentleman driver, Meyrat distinguished himself in the long distance French sports car races at Le Mans, Monthléry and Reims sharing drives often with Guy Mairesse at the wheel of the big Talbots and in the occasional F1 drive. He owned also two Talbot Spéciales, 90201 and 90203, purchased from his good friend Charles Pozzi. He quit racing after Le Mans 1956, where he had driven a Ferrari with Fernand Tavano. The son of a winemaker, Meyrat then acquired a Bordeaux “cru”, the Canon de la Gaffelière, of important reputation. Very aptly he became the mayor of the commune of Saint-Emilion in the centre of the Bordeaux wine region. His untimely death found him working in that function. An “affable and competent” man, Meyrat was the winner of a sports car race at Monthléry. As a matter of fact a Talbot arrived at Albi for Veyron. It was the old 82930 rented by Ecurie France from Rosier. Veyron, who was at home at Albi having won the Grand Prix three times and married a local girl, refused to race this wreck and left. Igor Troubeztkoy had just made tabloid headlines having married American billionairess Barbara Hutton, the richest girl in the world. He was the son of Prince Nicolas, a famous archeologist and adventurer, a man who made and lost several enormous fortunes in Russia and in the United States, the final loss occurring in 1917 after they had settled in 1911 in Paris, where Igor was born in 1912. As a consequence Igor's nationality was French as his education. His family had been left in very bad shape financially after 1917 and his youth was not an easy one. He became French varsity champion in cycling before being employed at a stockbrokers firm. He says that he sustained himself with the food at cocktail parties where the junior employee was always invited as a Russian Prince. After their marriage, Igor and Barbara lived in the largest suite of the Ritz in Place Vendôme. His craving for speed could have been easily satisfied with Barbara‘s money, but she bought him only a SIMCA 8 saloon. To get better performances from that car, Igor was directed to Amédée Gordini and a new world was revealed to him. Seduced by the very lively atmosphere of boulevard Victor, he conviced his wife to finance the purchase of the single-seat T11 02GC (if it had been a true purchase or a lease with maintainance included is not clear). As a matter of fact, the prince was utterly bored. Barbara was a depressed person, an anorexic that would eat only tiny morsels and would stay for days closed in her room, and so racing was a welcome diversion. He ran seven races in 1947, often spinning but enjoying himself thoroughly. The man with a rich wife attracted many wheeler-dealers. It seems that it was Freddy Zehender to put in touch Troubeztkoy with Count Sterzi, a Milanese nobleman of much more recent vintage, with whom they ordered two Ferrari 166 "for the price of one" and they raced as a team called Gruppo Inter. In 1948, Igor raced both the Ferrari and the Gordini with mixed results until one autumn day while testing the Ferrari at Monthléry he thought that: ”It is of no interest to run without spectators and if now I race only to be seen, it is idiotic. Boredom was in fact getting me, so I stopped immediately and I sold my Ferrari.” Igor’s racing career had lasted for less than two years. “It was a period of my life in during which I enjoyed myself a lot, but I am very happy to have come out of it alive...” He soon divorced Barbara and begun a distinguished career of art dealer, becoming once more very rich. During 1948 Troubeztkoy won one international F2 race at Angoulême and the Tour of Sicily partnered by none other than Clemente Biondetti. They really shared the drive, apparently. He could not race in the Mille Miglia since he had to rush back to his wife who had tried to commit suicide. This fact allowed Nuvolari – who took the wheel instead - to stage the last “heroic” performance of his career. L’Action Automobile duly lists the French Ecuries in its February 1947 issue. “In order of their foundation”, team manager between paretheses: Equipe SIMCA-Gordini (A. Gordini), Ecurie “Naphtra-Course” (M.me Depoix), Ecurie Tricolore (R. Labric and Paul Pinay), Ecurie France (P. Vallée and E. Chaboud), Ecurie France-Course (Jean Achard), Ecurie Verte (Marmonnier), Ecurie Walter Watney and the Lucy O’Reilly Schell’s outfit based in Monaco. They were all active in Grands Prix with the exception of Ecurie Verte which raced voiturettes and in rallyes. Ecurie Tricolore had put down an order for two Altas Grand Prix, intended for Trintignant and a second unnamed driver. The Ecurie had #4 and #5 in the order of priorities at the factory. The Altas GP chassis 4 and 5 were never built, of course. Trintignant went his own way, while the Ecurie entered Rosier’s Talbot for a couple of races during 1947 before disappearing. The lack of new racing cars was a source of bitterness for Labric. He wrote in December 1946 in the miscellany column in L’Action Automobile: ”Today there are, evidently, drivers with a car and little or no future, and others without car but with a bright future…” This note appeared below one that gave account of the programs of Achard’s Ecurie France Course. A resentful reply by the France Course manager provoked a formal denial by Labric that he was hinting at Achard. The adverb “evidently” makes very hard to believe the denial.